Hey! It's not Monday morning! And that's not raw!! You're right. It's October, which means it's VeganMoFo - Vegan Month of Food! I'll post the Raw on $10 menus and recipes on Monday mornings, as always. But I'll also be (to the best of my ability) blogging most weekdays for the month of October. It's not going to be always all raw, but it will be always all vegan and always all delicious. I hope you enjoy a little deviation from what I usually do here, and if you have any suggestions or recipes you'd like to see, just let me know. "Everyone likes macaroni and cheese," a friend said to me recently. He was right. Just about everyone does like macaroni and cheese. Not only that, but no lesser an authority than The Farmer's Almanac 2012 edition, has stated that, "butternut squash pasta sauce" is a food fad to watch for the upcoming year. So here is a simple way to make an old favorite. Preheat oven to 350 degrees F. Place the butternut squash on a cookie sheet in the middle of the oven and bake for about an hour and a half. Let cool slightly, then cut in half. Scoop out the seeds (these can be roasted just like pumpkin seeds) and then scoop out about two cups of the butternut flesh into a food processor fitted with an "S" blade. To the butternut, add the almond milk,nutritional yeast, smart balance, olive oil, garlic powder, onion powder, and salt and process until very smooth and creamy. This will take a few minutes. And if using a smaller food processor, may have to be done in batches as well. Cook the macaroni according to package instructions, and drain well. Let cool for just a few minutes, then spoon in the cheese sauce and stir until well coated. This sauce can also be used over raw zucchini noodles. Toasted bread crumbs can also be added. Thanks Lisa for contacting me. The photos on your blog make every dish look delish. 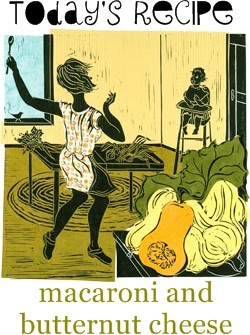 I am going to try the butternut macaroni for sure. Love the deviation from the usual and this recipe looks great! Will have to try. Thanks Lisa! Love some deviation Lisa! What is "smart balance"? I've never heard of that (as an ingredient in recipes) before. I love the change because change is GREAT!!!!! I will be trying this today as my vegan hubby is not always a fan of raw, and missed mac and cheese - thanks so much!! I have a butternut squash just waiting to be used, and I think this is how it will meet it's fate! (or at least part of it, since I'll probably halve it). I would guess you probably make a fair amount of raw milk from nuts; I would LOVE to see some creative ideas for what (other than muffins and raw crackers) to do with the leftover pulp. Thanks! Wow, this is fantastic! I can not wait to try this for my kids! any recipes you come up with are appreciated! mofo is all about breaking out of the usual and trying new things. at least, that's the way i see it. this looks great! looks good. I have plenty of butternut squash from my garden. May try that. I think that's an interesting change and a yummy recipe. Happy Mofo! I have squash in the oven right now! It will be turning into this! Soooo yummy ! I guess i'll have to practice my english too if i want to understand everything about your recipes ! Hey I make something really similar! Have the ingredients waiting at home right now - it's been on my mind lately and I need to make it soon. :) Your pictures remind just how delicious it is! I am amazed - you just toss the whole squash into the oven to roast? It doesn't explode? If this is true, I'll be eating winter squash more often! Jeannie, just throw it in the oven. It doesn't explode :) At least it hasn't exploded in my oven, and I've made it for several years that way. YYMV, but I don't think anyone is going to lose an eye via exploding squash! It makes it really easy to scoop the flesh out, too. Let me know how it turns out! What genius!! I was wondering how I could make a low-fat cheese sauce, and every recipe I come upon is super high in fat! Hi there - is there a substitution for smart balance? Adore the actual change in the typical which formula appears excellent! Will need to attempt. Many thanks Lisa!